Dr. Berliner is currently a third-year Cardiology Fellow at Northwestern Memorial Hospital in Chicago, IL. She completed her medical school training at Albert Einstein College of Medicine in Bronx, NY, in 2001. She completed her internship and residency training in Internal Medicine in the Department of Internal Medicine, New York-Presbyterian Hospital, Columbia Presbyterian Medical Center in New York, NY. She completed her training in Internal Medicine in 2004. She completed her Cardiology Fellowship in June 2007 and will complete an additional year in cardiac imaging training at Northwestern Memorial Hospital during the academic year of 2007-2008. Multidetector computed tomography (MDCT) may be useful in evaluating myocardial scar and viability in addition to its current clinical use in assessing coronary artery disease and coronary anatomy. Promising data suggest that MDCT may also be used to assess perfusion. Therefore, electrocardiographic-gated MDCT can potentially provide information on coronary anatomy, myocardial infarction, viability, and perfusion with one diagnostic test. Although clinical use is currently limited by radiation and contrast doses, future modifications may permit more widespread use of this technology. 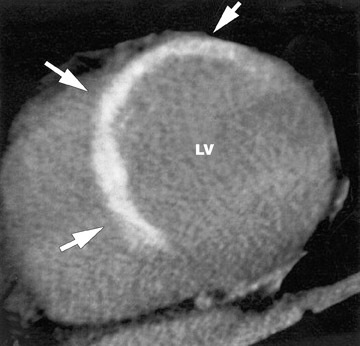 The use of computed tomography (CT) to assess myocardial scar, viability, and perfusion has been the subject of ongoing investigation. Although initial animal studies were encouraging, the clinical application of myocardial imaging with single-detector CT met many obstacles. 1-9 These included poor temporal and spatial resolution, extensive artifact due to cardiac motion, and unreliable intravascular contrast volume due to a significant first-pass effect. 10 With the recent advent of the electrocardiographic (ECG)-gated multidetector CT (MDCT) for the assessment of coronary artery disease (CAD), there has been a renewed interest in the use of CT to evaluate myocardial scar, viability, and perfusion. Gating the cardiac structures to the ECG has improved the temporal resolution of the conventional CT scanner to 82 to 165 msec. The use of ECG-gated MDCT permits a high-spatial-resolution, single-breath-hold technique, which enables the reconstruction of myocardial slices as thin as 0.5 mm. Both increases in spatial and temporal resolution allow clinically practical anatomical assessment of the coronary arteries in an intermediate- to high-risk population. 11 However, the anatomic assessment of obstructive CAD is only a part of the overall evaluation of patients with heart disease. Given the prognostic importance, research is being conducted to evaluate the ability of MDCT to assess myocardial scar, viability, and perfusion in addition to defining coronary anatomy. In both acute and chronic myocardial infarct, the revascularization of viable myocardium may result in improvement in ventricular function and long-term survival. 12-18 To date, rest-redistribution thallium scans, dobutamine stress echocardiography (DSE), and delayed enhanced cardiac magnetic resonance imaging (DE-CMR) are the most accepted means to evaluate myocardial infarction and viability. 14,16,18-23 Pharmacologic and exercise nuclear perfusion and PET scanning are well-established modalities to assess myocardial perfusion. The advantages of MDCT compared with these available imaging techniques include a greater spatial resolution and shorter scanning times. This article will review the literature to date on myocardial scar, viability, and perfusion assessment with MDCT. Most contemporary studies have used at least 16-slice MDCT for scar imaging. 24,26-31 Subjects have been pretreated with beta-blockers or antiarrhythmic therapy. According to the available data, the amount of contrast used varies in animal studies from up to a 150 mL bolus 24 to an equivalent of 200 mL in a 70-kg person. 26 A range of 120 to 140 mL of contrast has been used in studies performed in humans, which is more than the usual dose for imaging the coronary arteries with MDCT. 27,30 The contrast doses used in the human research trials are more feasible for clinical use than are those used in the animal models, although the increased contrast doses in the animal studies may result in improved image quality. During first-pass CE-MDCT images, the scanner is programmed to begin imaging at the time the signal in the ascending aorta reaches a predefined threshold of HU. Images are reconstructed in diastole of the cardiac cycle with retrospectively or prospectively gated cardiac MDCT, with or without dose modulation. Ten to 15 minutes after contrast injection, another CT acquisition is acquired to obtain DE-MDCT images. 26,27,30 The details of the CT protocols are provided in Table 1. The radiation doses range from 7 to 8.2 mSv for men and 7 to 10.7 mSv for women for the first-pass MDCT and from 2.4 to 2.7 mSv for men and 2.4 to 3.8 mSv for women for the DE-MDCT (Table 2). Typically, regions of hyperenhancement and hypoenhancement are visually identified by experienced operators. Once regions of delayed hyperenhancement are identified, investigators analyzed the involved regions quantitatively. 24,26-30 Differing methodologies to quantitate regions of hyperenhancement or hypoenhancement have been used. These include defining involved myocardium according to a 16-segment 27,28,30 as the sum of the hyperenhanced and hypoenhanced regions, 24 by the Simpson's method, 27 or as a percentage of the left ventricular 27,29,30 Investigators have also measured CT attenuation values (expressed in HU) of the hyperenhanced or hypoenhanced regions as compared with remote myocardium 26 and determined maximum signal intensity, wash-in time, and slope during the first pass of the contrast material to compare differences between normal and infarcted myocardium 29 (Table 3). Studies have evaluated first-pass CE-MDCT to identify myocardial infarct. 29,31 Mahnken et al 29 compared first-pass perfusion imaging between CE-MDCT and CE-CMR in an acute infarction porcine model. Areas of hypoenhancement were shown to correlate well with areas of myocardial infarction that were identified on pathologic specimens treated with triphenyltetrazolium chloride (TTC). Visual assessment of MDCT revealed hypoenhancement in 10 of 36 segments. Triphenyltetrazolium chloride staining proved the presence of myocardial infarction in these segments. 29 Nikolaou et al 31 retrospectively compared DE-CMR and perfusion CMR with first-pass CE-MDCT in patients who had undergone all 3 examinations for the assessment of myocardial perfusion and viability. 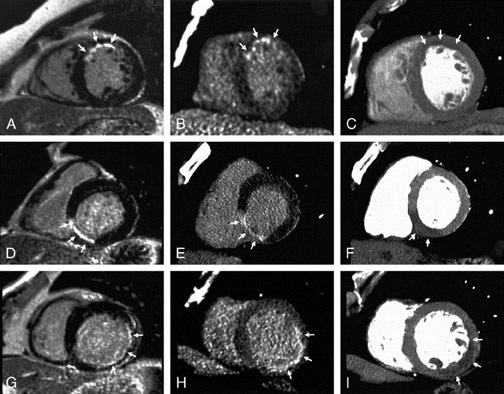 First-pass CE-MDCT was evaluated for areas of myocardial hypoenhancement. First-pass CE-MDCT accurately detected chronic myocardial infarctions, but ischemic perfusion defects were not reliably de-tected. 31 This is because hypoenhanced regions can correspond to either a poorly perfused region of myocardium or re-gions of microvascular obstruction. More recent studies have compared first-pass CE-MDCT to DE-MDCT. These studies indicate that DE-MDCT more accurately detects areas of myocardial infarction. 27,30 These data will be discussed in the following section. In a porcine model, the performance of DE-MDCT is in good agreement with DE-CMR and TTC pathology. 26 Preliminary studies have also been promising in humans. Mahnken et al 30 evaluated revascularized patients within 2 weeks of an acute ST-elevation myocardial infarction. Patients underwent DE-MDCT and DE-CMR. There was excellent agreement of myocardial infarction size and location for DE-MDCT and DE-CMR. The extent of myocardial infarction agreed in 415 of 448 (93%) (kappa = 0.878) of myocardial segments. The mean size of myocardial infarction on MRI was 31.2 ± 22.5% per slice compared with 33.3 ± 23.8% per slice for late-enhancement MDCT (Figure 5). 30 Gerber et 27 evaluated the correlation between CE-MDCT and CE-CMR in patients with either acute or chronic myocardial infarctions. They performed first-pass MDCT, first-pass CMR, DE-MDCT, and DE-CMR. There was good agreement of delayed hyperenhanced regions between DEMDCT and DE-CMR on a segmental basis (82%, kappa = 0.61, P <0.001), with slightly better concordance for acute (kappa = 0.68, P <0.001) than chronic patients (kappa = 0.52, P <0.001). Concordance for identification of infarct location was excellent if performed on a patient basis (kappa = 0.90, P <0.001). 27 Given the anatomic correlation between DE-MDCT and DE-CMR, findings on DE-MDCT are expected to have similar prognostic implications as DE-CMR. Furthermore, the improved spatial resolution of MDCT, permitting slices 5 to 10 times thinner than those used for CMR viability imaging, may allow for more detailed myocardial imaging. This may be useful for improved scar localization for ablative therapy in the treatment of arrhythmias. Comparison with dobutamine stress echocardiography- Habis et al 28 compared viability assessment between CE-MDCT and DSE. The initial investigations have found DE-MDCT to be a comparable imaging technique to DE-CMR for evaluating infarct size. These studies did not evaluate the prognostic implications of these similarities. The above study conducted by Habis et al 28 is the first study to indicate that the anatomical extent of infarction demonstrated on MDCT may reflect myocardial viability (Tables 3 and 4). Although the initial studies have been promising, additional research is necessary to explore the clinical use of MDCT in imaging myocardial infarcts. Scar on DE-MDCT may have similar prognostic implications as scar identified with DE-CMR, but prognostic data are not available yet. Although preliminary data comparing DE-MDCT with DSE are promising, 28 no study to date has confirmed that the anatomic similarities seen with DE-CMR and DE-MDCT translate into clinically meaningful prognostic information. A larger study evaluating morphologic and prognostic similarities between DE-CMR and DE-MDCT is necessary. Further development of myocardial imaging techniques with MDCT is necessary. Current use compares the relative differences between normal and abnormal myocardium. Defining regions based on absolute values may also be useful. This would permit the evaluation of more subtle differences between normal and abnormal myocardium on the basis of a systematic reduction in global flow reserve. This may aid in the identification of microvascular disease, a disease ubiquitous in diabetic patients, rather than limiting evaluation to large epicardial arterial disease. Pharmacologically induced coronary vasodilation with adenosine is an established diagnostic tool to evaluate obstructive CAD. 36-39 Adenosine stress testing is routinely performed with single-photon-emission CT (SPECT) imaging. Adenosine perfusion CMR has also been reported to accurately detect significant coronary occlusive disease when compared with invasive coronary angiography. 40,41 Preliminary research, described above, has established similarities in infarct imaging between CE-CMR and CE-MDCT. Given these similarities, the success of studying myocardial perfusion with CMR may be applicable to cardiac MDCT. Multidetector CT has been shown to accurately measure myocardial blood flow. 42 If MDCT perfusion can successfully diagnose obstructive CAD with similar accuracy to available noninvasive stress imaging studies, it will be the first noninvasive imaging tool to provide complementary information on coronary anatomy and its physiologic consequences with one diagnostic study. Most contemporary studies have used a minimum of 16-slice capability MDCT for perfusion imaging. 43,44 Subjects have been pretreated with beta blockers to lower resting heart rates. Adenosine is then infused for a total duration of 5 minutes. Three minutes into the 5-minute adenosine infusion, the stress images are obtained. If a rest scan is performed, it is done 20 minutes after the stress perfusion scan. 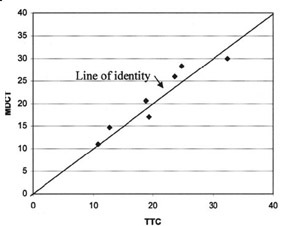 The amount of contrast given is 100 mL in animals and 70 mL per scan in humans. During the first-pass contrast-enhanced imaging, a single 3-dimensional set of images is acquired. The scanner is programmed to begin imaging at the time the signal in the ascending aorta reaches a predefined threshold of HU, or by calculating the scan delay using a test dose. 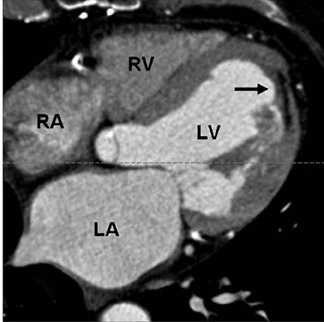 Images are usually reconstructed in diastole with retrospectively gated cardiac MDCT. 43,44 Estimated radiation doses were not provided in these studies. Pharmacologically induced vasodilator coronary perfusion studies with MDCT have been evaluated both in animal and human subjects. 43,44 George et al 43 evaluated the accuracy of first-pass CE-MDCT in measuring differences in regional myocardial perfusion during adenosine stress in a canine model of LAD stenosis. 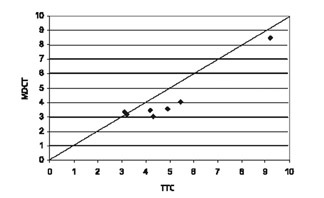 Eight dogs underwent LAD stenoses to maintain baseline flow, but attained a ≥50% reduction in hyperemic flow. Contrast-enhanced MDCT imaging was performed once during a 5-minute adenosine infusion (Figure 8). Regional signal densities were evaluated in stenosed and remote territories and compared with microsphere-based myocardial blood flow measure- ments. A significant linear association was found between the regional signal intensity and myocardial blood flow in the region of the myocardium supplied by the stenosed artery (Figure 9). This study found that adenosine-augmented first-pass CE-MDCT can be successfully performed in a canine model of LAD stenosis. Kurata et al 44 performed a similar study in 12 human subjects without known CAD who presented with new-onset angina, were asymptomatic with multiple coronary risk factors, or had an abnormal exercise ECG. The patients underwent conventional SPECT stress testing with an exercise- or adenosine-induced stress thallium-201 and adenosine CE-MDCT. 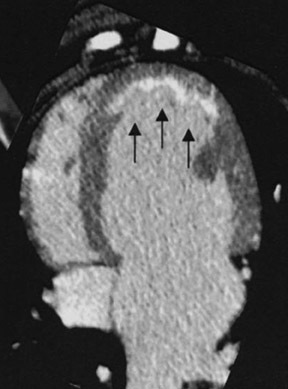 The stress CE-MDCT was performed 3 minutes into a 5-minute adenosine infusion, and the rest CE-MDCT was performed 20 minutes after the first scan. Adenosine stress CE-MDCT was compared with stress thallium-201 myocardial perfusion scintigraphy. There was agreement between CE-MDCT and SPECT imaging in 30 of the 36 (83%) evaluated vascular territories. 44 Although larger studies are necessary, this is the first published data revealing promising results of the use of MDCT to evaluate myocardial perfusion. Contrast-enhanced MDCT perfusion is an attractive imaging modality. With one diagnostic test, information on coronary anatomy and its physiologic effects on myocardial perfusion, the presence of myocardial viability, and an assessment of myocardial function would potentially be available. Preliminary data suggest promising results in a very select patient population. These studies have indicated that perfusion defects can be identified with first-pass CE-MDCT during adenosine infusion. The initial positive results are tempered by many challenges that must be overcome be-fore the widespread clinical use of this technique. Studies validating the technique in larger clinical populations of patients with diverse coronary anatomy and clinical presentations are necessary. Further investigation is also necessary to validate the use of first-pass imaging to accurately evaluate myocardial perfusion with CE-MDCT and to define the appropriate use of CE-MDCT in clinical practice. Future uses may include performing stress perfusion in patients following the detection of an intermediate stenosis on CT angiography. 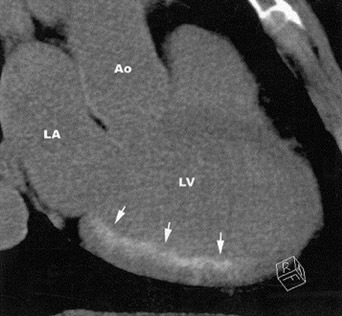 This would enable clinicians to evaluate for the presence of ischemia in the region of myo-cardium supplied by an artery with an intermediate lesion. There are obvious limitations that require exploration prior to widespread use of cardiac CT as the diagnostic modality of choice. The largest problem to pursuing CT angiography and viability assessment in patients is the risk associated with the increased radiation dose. 45 To evaluate myocardial perfusion and viability, there is an even larger exposure to radiation due to the need for a minimum of 2 MDCT scans during 1 study. The second scan requires ap-proximately 2 to 4 mSv of radiation. Techniques are available to decrease the amount of radiation, including ECG-dependent dose modulation and the use of scanning protocols with lower tube voltages. 46 Other than radiation exposure, there are also potential nephrotoxic risks associated with IV contrast. In addition to the risks associated with performing the CT scan, other limitations include the first-pass effect of contrast uptake resulting in an unreliable intravascular content of contrast and decreased signal-to-noise ratio when compared with CMR. 10,27 Although in some studies, the actual regions of hypo-perfusion are evaluated both quantitatively and qualitatively, the region of hypoenhancement is typically identified visually by experienced observers. One would expect the area of hypoenhancement on first-pass imaging to be larger than that of hyperenhancement on delayed contrast-enhanced imaging. Regions of microvascular obstruction and infarction as well as areas of hypoperfusion should produce hypoenhancement on first-pass imaging. In the studies described above, areas of hypoenhancement on first-pass imaging are smaller than those seen on delayed enhanced imaging. This may be a result of the poor signal-to-noise ratio associated with MDCT. Observers may not be able to accurately identify regions of hypoenhancement, as those areas may not produce a large enough difference from the normal myocardium to be visually detected. 27,30,31 A reliable, reproducible method to evaluate the myocardium is essential. Therefore, further research is necessary to determine better methods to quantify signal differences between normal and abnormal myocardium. Larger studies are also necessary to validate the promising results found in the small initial studies that are currently available. These studies should be performed in clinical populations of patients with diverse coronary anatomy and clinical presentations. Larger clinical trials should include a follow-up period to evaluate patients' clinical outcomes. CT viability and perfusion imaging are promising imaging modalities in the early stages of investigation. Some of the technical limitations described above may be overcome by emerging technologies, including dual-source scanners, 256-slice scanners, and flat-panel scanners. Although further research is necessary to refine the technique, there is promise that cardiac CT will provide complementary information, evaluating coronary anatomy and myocardial imaging with one imaging modality. Further modification and reduction in radiation exposure will be necessary before this technology is applicable for widespread use. I would like to thank Issam Mikati, MD, Francis Klocke, MD, Edwin Wu, MD, Nirat Beohar, MD, James Carr, MD, Vera Rigolin, MD, and Robert Bonow, MD, for their continued dedication to teaching and their assistance in preparing this manuscript. The role of multidetector CT in the assessment of myocardial perfusion, infarction, and viability. Appl Radiol.